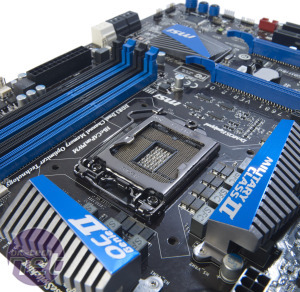 Before the Sandy Bridge chipset fiasco, MSI sent us the P67A-GD65 to review. 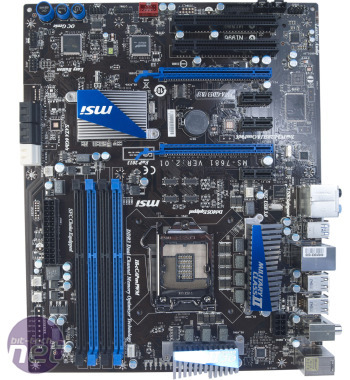 We liked the board, but it was just a little overpriced compared with the original Asus P8P67. 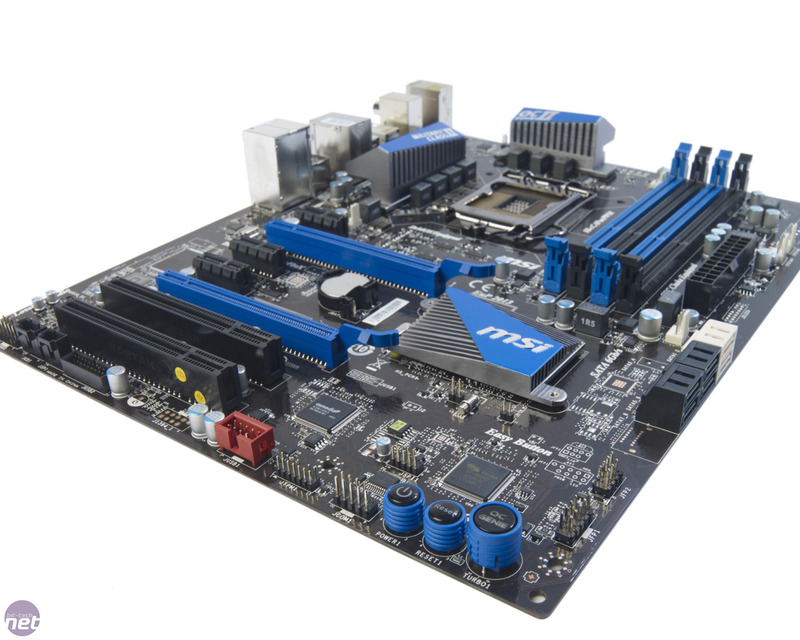 MSI seems to have taken these comments on board, however, and has sent us the P67A-GD53 (B3) this time, which is a slightly cut-down but substantially cheaper version of the mid-range board. The P67A-GD53 costs just £108.88, which puts it towards the cheaper end of the LGA1155 motherboards that we’ve seen. Interestingly, though, it isn’t initially obvious where MSI has focused its cost-cutting. 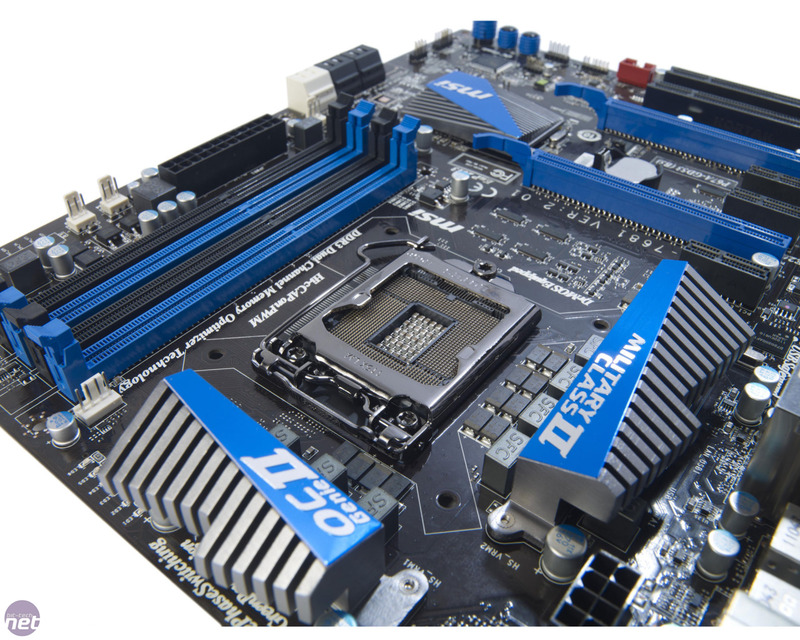 The P67A-GD53 is a standard sized ATX board and has the same three heatsinks as the more expensive P67A-GD65. The two heatsinks that sit near the CPU socket are responsible for cooling the VRM circuitry, and while they look a little puny at first, they’re more than up to the task. This is because the GD53 is equipped with MSI’s Military Class II VRM components. This all sounds rather silly, but the super ferrite chokes run noticeably cooler than the chokes on some other motherboards. 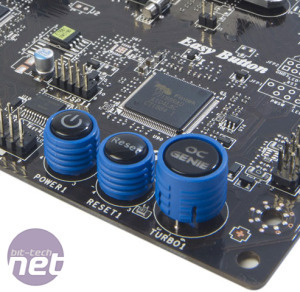 The Hi-c capacitors that make up the second part of the voltage regulation module, which cheaper boards in MSI’s range lack, also play their part. They’re more thermally tolerant than standard solid-state capacitors, so they don’t require as much cooling. All this adds up to some significant benefits – the VRM heatsinks can be relatively small, allowing for more room around the CPU socket and they don’t require as much airflow. This is good news if you want to build a quiet PC, whether it’s air-cooled or water-cooled. We were also pleased to see on-board power and reset switches on the GD53. These have a fairly niche appeal, but they're very useful when you’re either testing your new build before you install it in your case, or fiddling around inside your PC to upgrade it at a later date. Also present is an OC Genie button, which promises one-second overclocking. This may seem a bit like cheating, but it made basic overclocking a quick and easy job. Meanwhile, the rear-panel Clear CMOS switch will make it easier to get your PC working again if you're too ambitious with an overclock. The GD53 also retains the SLI and CrossFireX support of the GD65, which will please fans of dual-GPU setups. There’s plenty of room between the two 16x PCI-E slots too, so your graphics card coolers will have a fighting chance of keeping your precious GPUs cool. Complementing the two 16x slots are three 1x PCI-E slots and a pair of PCI slots. The GD53 has seen some cost-cutting in its ancillary connections however. 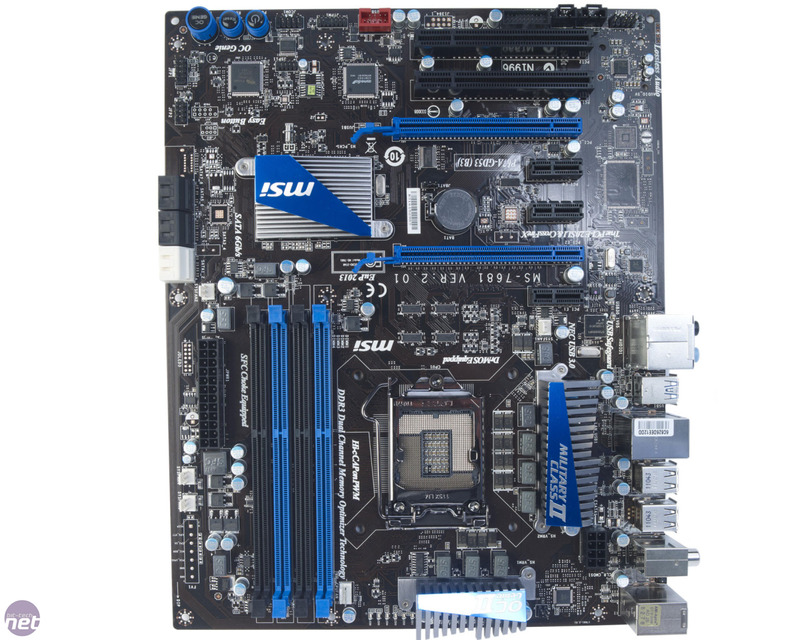 It lacks the FireWire port found on many of the other LGA1155 boards we've seen, for example, and has only two USB 3 ports, rather than the four that are quickly becoming the norm. Confusingly, the board still sports an internal USB 3 header, even though the controller chip that serviced it has been removed. This header instead provides a pair of USB 2 connections, although you’ll need to use the bundled adaptor to use them.